Manage your tabs with simplicity. Simple overview of open windows and tabs allowing you to quickly navigate to tabs and windows with mouse or keyboard. Access your saved windows from all your devices. Start a project on one computer and pick up where you left off on another. Find open tabs by searching for tabs by URL or domain keywords with live search filtering. Cluster is built to only use the resources needed when its active, making it small and lightweight in comparison to other extensions. Suspend tabs in windows to free up memory so you can quickly load the tab back up when you need it. Sort open tabs by ascending, descending or by domain groups. Domain groups sorting provides tools for managing tabs in each domain. Drag and drop tabs between open windows or easily move multiple tabs between windows or to a new window. 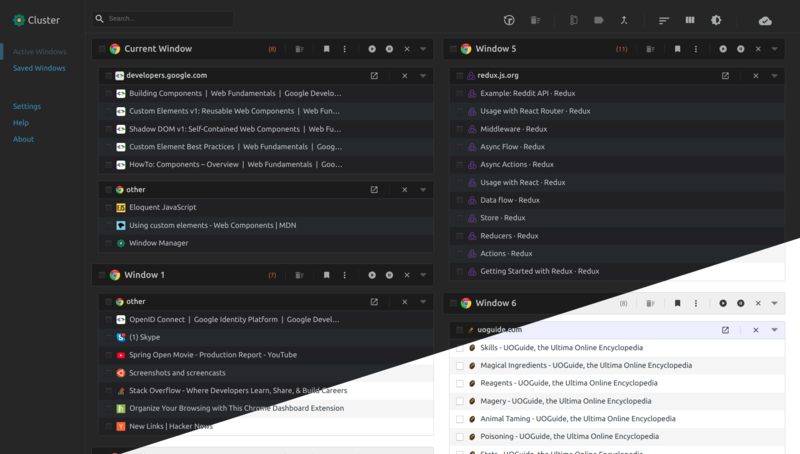 Support for wide screens with multiple window columns for better overview of open windows and tabs. Save windows and tabs, or move tabs to an already saved window, to organize your current projects and to quickly restore them at a later time. Restored windows opens each tab in a suspended state to minimize the load time when opening lots of tabs at once. Quick and easy exporting of saved windows as JSON or CSV. Supports importing one or multiple windows. Navigate between your windows and tabs and access fast search without leaving the keyboard.